Henry David Thoreau once wrote that spring “is a natural resurrection, an experience of immortality.” Every spring, your garden and yard are renewed with fresh, beautiful, growth. The problem is that without careful management your gardens resurrection can go from beautiful to a thing of horror, like an episode of The Walking Dead. That’s because weeds are nature’s zombies. Like zombies weeds are difficult to kill, they keep coming back, and once they get a foot hold can take over your garden. 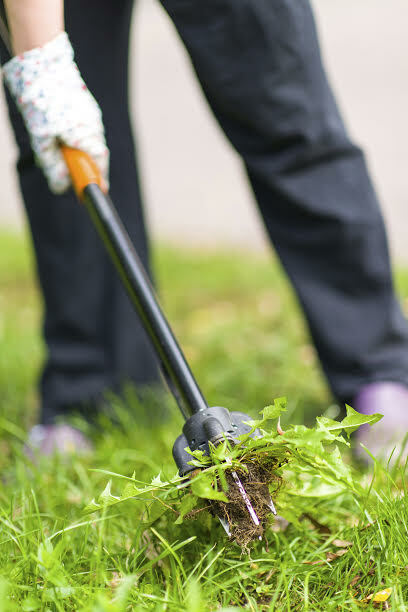 The best way to stop weeds from ever becoming a problem is to use preventative weed control practices. The application of pre-emergent herbicides is one of the best weed control practices for your yard. Pre-emergent herbicides work by releasing a chemical that prohibits an enzyme necessary in the process of seed germination. Without the enzyme a seed cannot germinate and grow. Because of this pre-emergents only work on seeds and not growing plants. Pre-emergents should be applied soon as, after the lawn has greened up the weeds will already have started to germinate and grow. Another problem with pre-emergents is that you have to be careful about where you apply them, as pre-emergents prevent all seeds from germinating not just weeds. For areas where you have seeds you’re hoping to grow you’ll need to use other methods, such as mulching. Mulching is an effective method of weed control in areas where you’re planting seeds and don’t want to use pre-emergent herbicides. The way mulching works to prevent the growth of weeds is by preventing light from reaching the seeds and making it difficult for shoots to reach the surface. Of course, this also presents problems for the seeds you desire to grow. There are a couple of ways you can go about mulching, but still allowing your seeds to grow. The first way is to put your mulch down, but grow your seeds in separate containers and transplant them after they’ve grown a good shoot. Another method would be to put down your mulch and carefully make small gaps and plants your seeds in those gaps, closing the gaps once shoots start to come up. Finally, you can just plant your seeds and hold off on mulching until the sprouts are of sufficient size, pulling any weeds that grew in the meantime. Even with the application of pre-emergent herbicides to your lawn, and mulch to your beds, some weeds will slip through the cracks in your defenses and find ways to grow. The best way to stop these weeds from becoming a more serious problem is to weed early and often. Somewhat counterintuitively, the more often you weed, the less time it will take. Younger weeds are easier to pull and catching them young prevents them from producing more seeds and spreading. If you keep up with a little bit of weeding every time you step outside, you won’t have to pull more then a couple of weeds a day. This entry was posted on Wednesday, March 18th, 2015	at 7:21 pm	and is filed under Lawn Maintenance Service	. You can follow any responses to this entry through the RSS 2.0	feed. Both comments and pings are currently closed.